RL&L night on Saturday packed the gym with students and faculty for the first home game of the spring semester between the Tarleton Texans and the West Texas A&M Buffs. 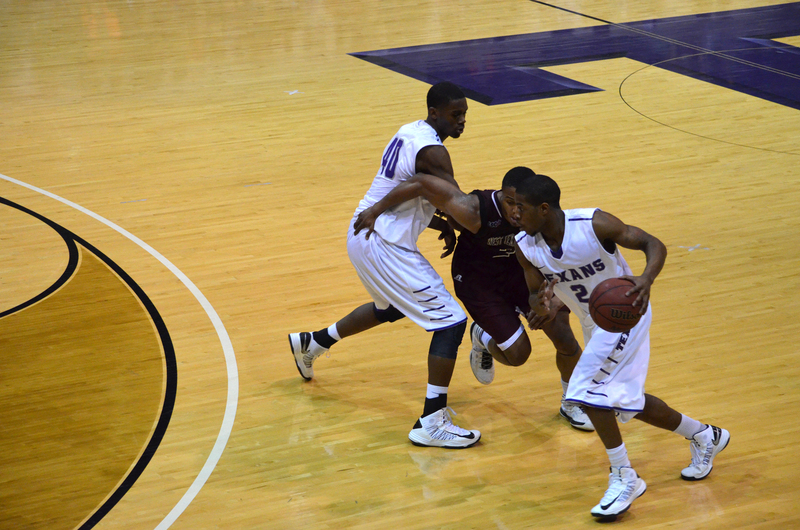 The Texans and Buffs conference rivalry led to an exciting and aggressive game which ended in a Tarleton victory 65-50 over West Texas. The Texans, off to a rough start, are now 3-5 in conference play and snapped their four-game losing streak Saturday night. De’Andre Upchurch, with 14 points on the night, led the Texans to a very strong start ahead of the Buffs 31-13 at halftime. A slow second start for the Texans led to the Buffs going on a 10-2 run within the first five minutes of the half, closing the gap from 18 points to 10 and making it 33-23. The end of the game brought some tension on the court and led to a double technical for each team and two West Texas players fouling out of the game. Chuck Guy led the Texans with 22 points on the night and closed out the game with eight of those points within the last minute. The Texans ended strong with a 65-50 finish over the West Texas A&M Buffs. Looking to continue their success, the Texans resume play again on the road January 29 at 4 p.m. against the Texas A&M Commerce Lions.